Tianjin (天津) is the sixth largest city in China by population. It is one of only four directly controlled municipalities enjoying provincial-like status as Special Economic Zone (SEZ). (The other three are Beijing, Shanghai and Chongqing). It is a large modern city with the outskirts dominated by industry. It is also a port city and in 2005, a section of Tianjin was awarded Special Economic Zone (SEZ) status. China has three "Golden Week" holidays per year. People get a mandatory two or three days off work for each holiday, and workers' companies can grant them the rest of the week off, making each holiday a total of 7 days. As you can imagine, having almost 1.4 billion people with the same days off can make travelling at these times arduous to say the least. Travelling during the Spring Festival/Chinese New Year is incredibly difficult. Chinese New Year is China's Christmas, so the millions of migrant workers and students flood back to their home towns. Everybody else takes the opportunity to spend their hong bao (gifts of money traditionally given at CNY) and go travelling. Most of the time, since you are only allowed to purchase train tickets 6 days in advance and must be present in the city of origin, sometimes only standing room tickets are available. Be aware! The Spring Festival is undoubtedly the busiest time for the Chinese transportation system. Flying will avoid the crowded trains, but book early and expect to pay higher prices. All the main tourist attractions will be crawling with tourists (worse than usual), so unless you like crowds, it's best to avoid it altogether. Chinese New Year is based on the lunar calendar, so the date changes each year. The Chinese New Year/Spring Festival holiday is 7 days long and usually starts on New Year's Eve. The two other national holidays are October 1st, National Day, celebrating the founding of the People's Republic of China and May 1st, which is International Labor Day. Almost all Chinese get the two holidays off and many take the opportunity to travel. If you want to avoid the crowds, fly, but it should get a lot less busy towards the end of the week. Tianjin Binhai International Airport (TSN) flies to many destinations in China and some around East Asia, although most international flights are to Japan and South Korea. For longer distance international travel, it is probably easier to fly to/from Beijing. Many budget airlines have started flying into Tianjin because it is cheaper then Beijing this includes the Air Asia, which has a daily flight connecting Tianjin with Kuala Lumpur (6 hours). Sometimes these flights will say they are flying directly to Beijing but then land in Tianjin and you get loaded on a bus to the Beijing airport. Buses operate between the train station and the airport and should take around 30 minutes. Buses directly to the Beijing airport, costing RMB70, leave from the Air China building near Nanjing Lu and Shanxi Lu, which near the earthquake memorial. These buses leave every 30 minutes starting at 6:00am till 5:30pm. They starting going from Beijing to Tianjin at 9:00am till 10:00pm. The bus ride is suppose to take 2 and half hours but can take up 4 hours. There are no stops for the bathroom. There are 5 train stations in Tianjin, however the main railway station (天津火车站) is your best bet for long distance travel. You can travel to all major cities in China. A Z-Train, which is the fastest train on this line, operates between the main station and Beijing south station. This is the easiest and quickest way to travel to/from Beijing. It takes about 30 minutes and costs around RMB60 for a one-way ticket. There are also overnight Z-Trains that go to Shanghai. Tianjin has many names such as Beijing's little Brother, the biggest small town in China or the pollution capital. What this all means is this is a very Chinese city. Bikes, motorbikes, cars, trucks, tri-bikes and donkey's in certain areas all compete for the road. Pretty much from sunrise to about 9pm the roads are packed with every form of transport going every which way. In the concession area the twisting oneway streets even confuse veteran taxi drivers, and it doesn't help they are trying to avoid bikes going the wrong way and the right way constantly. In general it would be better not to drive your own car in Tianjin. Travel around Tianjin by public transport is easy with efficient and well connected transport links. Currently, Tianjin has 2 metro line, with 7 more planning to be completed by 2013. A modern bus system and tramway operates throught the city. It is clean and some newer buses are air-conditioned. Costs start at RMB1. Taxi's are prolific and a convenient way to travel around the city. Walking tours of the concession area can be very nice. All the streets have sidewalks and looking at European 19th century buildings in china can be interesting. Unlike Shanghai most concession homes are still lived in by the same residents since 1949. Biking is a great way to get around Tianjin. Bike's still rule the road and all the major road ways have concreted bike lanes, although sometimes cars will still go down them. Remember that during rush hours the number of bikes and cars can be a bit daunting but if you go slow and pick your way you should be fine. Due to its proximity to sea, seafood features heavily in the local diet. Being in the north of China, steamed buns and noodles are also common. 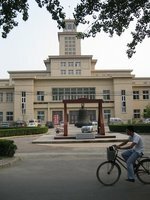 Nankai University was the first western style university founded in China and is considered a top 10 school in China. The large campus has several green spaces, which are pretty. The school also has an excellent teaching Chinese to foreigners program. Tianjin University is located just north of Nankai and is a very pretty campus with several restaurants on it. This school also has an excellent teaching Chinese to foreigners program. Wangba (联网) means internet bar in Chinese. Almost every town will have an internet bar or gaming center. The best way to spot an internet bar is to look for the 网(ba) character, which means net, and large digitized images of computer game characters. Often, there will be a sign saying Green Power in English at the entrance. Most gaming centers cost about RMB3 an hour. You prepay at the main desk and are then given a plastic card or a piece of paper. Once you are done you return the card or piece of paper and get reimbursed for the money you didn't spend. Be prepared for a place that might be dingy, basic and messy. Internet bars in China tend to get crowded starting in the late afternoon to the late evenings. Some hotels provide access from the rooms that may or may not be free; others may provide a wireless service or a few desktops in the lounge area. Also, quite a few cafes provide free wireless Internet service. Some cafes, even provide a machine for customer use. The country calling code to China is 86. To make an international call from China, the code is 00. When making international phone calls it is best to buy an IP card. They typically have a value of ¥100 but sometimes can be had for as little as ¥25. The cards have printed Chinese instructions, but after dialing the number listed on the card English-spoken instructions are available. As a general indication of price, a call from China to Europe lasts around 22 minutes with a ¥100 card. Calls to the U.S. and Canada are advertised to be another 20% cheaper. There is no warning before the card runs out of minutes. If you already have a GSM 900/1800 cellphone, you can roam onto Chinese networks, but calls will be very expensive (¥12-35/minute is typical). If you're staying for more than a few days, it will usually be cheaper to buy a prepaid Chinese SIM card; this gives you a Chinese phone number with a certain amount of money preloaded. Chinese tend to avoid phone numbers with the bad-luck digit '4', and vendors will often be happy to offload these "unsellable" SIM-cards to foreigners at a discount. If you need a phone as well, prices start around ¥100/200 used/new. Chinese phones, unlike those sold in many Western countries, are never "locked" and will work with any SIM card you put in them. China's two big operators are China Mobile and China Unicom. Most SIMs sold by the two work nationwide, with Unicom allowing Hong Kong/Macau/Taiwan usage as well. There is usually a surcharge of about ¥1/min when roaming outside the province you bought the SIM, and there are some cards that work only in a single province, so check when buying. China Post (中国邮政) is the official postal service of the People's Republic of China, operated by the State Postal Bureau of the People's Republic of China (website in Chinese only), and has more details about price to send letters, postcards and parcels, both domestically as well as internationally. The Chinese postal service is very good. Remember that in more remote places usually only one post office in a city can handle sending international boxes or letters. Also many times it might be worth having the name of the country you are trying to send to in Chinese characters, because small town people might not know what Estonia is in English. Post offices have a striking green logo and can easily be found everywhere in the cities. They are mostly open every day (including weekends!) from 8:00am to 6:00pm, though small offices might have shorter opening times, while the bigger ones in central and touristic areas are sometimes open during evenings as well. We have a comprehensive list of accommodation in Tianjin (City) searchable right here on Travellerspoint. You can use our map to quickly compare budget, mid-range or top of the range accommodation in Tianjin (City) and areas nearby. This is version 29. Last edited at 3:31 on Aug 2, 17 by sleepBot. 11 articles link to this page.